There are times in our life that we see a photo like this that sparks (no pun intended) the fight between Heaven and Hell, Good and Evil. The cartoon Sheepdog vs Wile E. Coyote. I think no matter which branch you cling to on the religious tree, we can agree there is good and bad in the world. 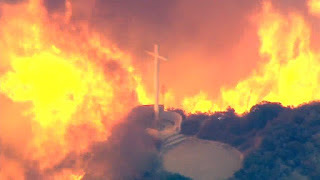 Bad appears to be fire approaching a picturesque cross on a cliff in this case. I use the word 'appear' because if you talk to anyone at the National Forest Service they will tell you that when contained, Fire in itself is a good thing. It burns out undergrowth and allows room for new saplings to grow into the forests of tomorrow. This picture though is not just a contained wildfire that got out of hand, its costing lives, destroying property and changing life forever for many families. I would hope rather that focus on the flames we think about the cross and it's meaning, and for that matter whatever your religion uses as a symbol. That cross is a sign, a sign of peace and love and despite what is happening around it, all will eventually be OK. So I urge you to pray tonight for those impacted by this horrible fire that one day they will eventually be able to return to a normal life, a life without flames and one which follows the ways of the cross.